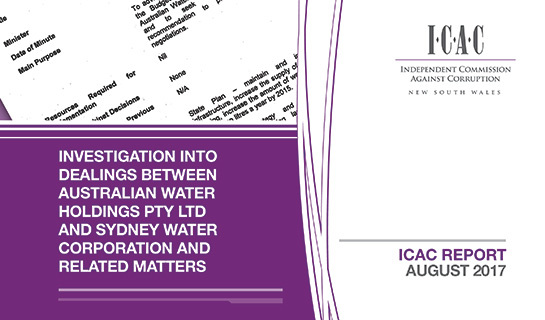 In August this year, the ICAC released its long-awaited report on Operation Credo , the investigation into dealings between Australian Water Holdings (AWH) and Sydney Water Corporation. Three members of Parliament and a senior staff member were found to have engaged in serious corrupt conduct. The public standing of the individuals involved garnered a lot of attention, but it is also true that strong controls, practices and staff combined to thwart what would have been a very lucrative deal. The report found that four public officials – Edward Obeid Sr, Joseph Tripodi, Anthony Kelly and Gilbert Brown – had engaged in serious corrupt conduct. At the time, Mr Obeid Sr, Mr Tripodi and Mr Kelly were members of Parliament (Mr Kelly had ministerial responsibility for infrastructure) and Mr Brown was a senior member of Mr Kelly’s staff. The ICAC found that Mr Obeid Sr knew that a successful outcome for AWH's public-private partnership (PPP) proposal would financially benefit the Obeid family in the event shares were acquired in AWH. The ICAC found that his son, Edward Obeid Jr, worked with an AWH-related entity. Mr Obeid Sr misused his position as a member of Parliament to promote AWH’s desire to be provided with exclusive rights to build and profit from water infrastructure in parts of north-western Sydney. This was to be in the form of a directly negotiated (PPP). The ICAC found that Mr Tripodi, Mr Kelly and Mr Brown were involved in preparing a Cabinet minute aimed at providing AWH with the directly negotiated PPP it – and Mr Obeid Sr – sought. The ICAC’s investigation found that the Cabinet minute contained falsehoods and misleading omissions and was created for the purpose of improperly favouring Mr Obeid Sr.
Operation Credo generated significant media attention and public comment. While it is true that the conduct uncovered by the ICAC was extraordinary and newsworthy, it is important to note that a number of better practices were followed by some public officials who were acting in the public interest. Drafting a deliberately false and misleading Cabinet minute entailed a significant degree of risk. However the minute was ultimately withdrawn. This suggests that there were some robust controls and procedures in place, as follows. 1. Despite the efforts of Mr Obeid Sr, Mr Kelly, Mr Tripodi and Mr Brown, the Cabinet minute did not succeed in its purpose. Acting on advice from her own department and NSW Treasury, then premier Kristina Keneally stopped the minute from proceeding and told the ICAC that it was “bad public policy” that would have “resulted in a bad outcome for the people of NSW”. 2. The NSW Government’s process for evaluating PPPs (set out in the Working with Government: Guidelines for Privately Financed Projects) did its job. An expert, independent assessment of the AWHs’ PPP proposal found that it did not provide value for money for the state. This assisted the ICAC in exposing the falsehoods contained within the Cabinet minute. 3. Mr Obeid Sr and AWH representatives sought to advance their commercial interests in a variety of ways and by making strong representations to numerous public officials. This included raising the possibility of litigation and making complaints that Sydney Water “was attempting to commercially frustrate AWH”. The ICAC found that, on one estimate, if the PPP proposal had been agreed to, the value of AWH would have increased from about $47 million to $156 million. So, while direct negotiations (the kind employed for this PPP) are not, by themselves, corrupt, it is easy to see the significant benefit that would have been conferred had the PPP been approved. Direct negotiations feature in a significant proportion of the ICAC’s investigations into corrupt conduct. They are especially risky when initiated by the likely beneficiary or when relationships between the beneficiary and a public official exist. As the ICAC has stated previously, as a general rule, direct negotiations should be avoided.